Now available for the first time and exclusively produced for The Keyboard Company, the Topre Realforce88UB keyboard, in Swedish/Finnish layout, is a joy to type on. It incorporates Topre's patented 30 million key life cycle non-contact electrostatic capacitance switches with a switch weight of 45g. The subtle black on black keycaps with their tactile feel and N Key Rollover ensure fast and accurate input. It's the keyboard everyone dreams of, but is turned away by the expensive price. I thought I wouldn't let my dreams be dreams anymore and got it, and here's my thoughts after few days of use. Keyboard comes in plain brown box, which is fine with me, I'm more of a functionality over flair guy. From the box the keyboards cable is routed to the right which I imagine not many people will leave like that so it's a weird choice, and it's placed really tight in the routing channel took me sometime to undo it. Now, to the stuff that matters, how it feels. In one word, great. If you're like me and coming from Cherry MX Blue, instantly you'll notice the difference in sound, this thing is quiet. Typing feels like you're typing on clouds, most comfortable keyboard I've ever had. I've played some games with it too and got used to it very fast, but people with heavier hands might want to look into the 55g version. Honestly, I have nothing bad to say at this point, I expect this keyboard to last me 4+ years so unless something happens to it during that time, I'm completely overjoyed with my purchase. 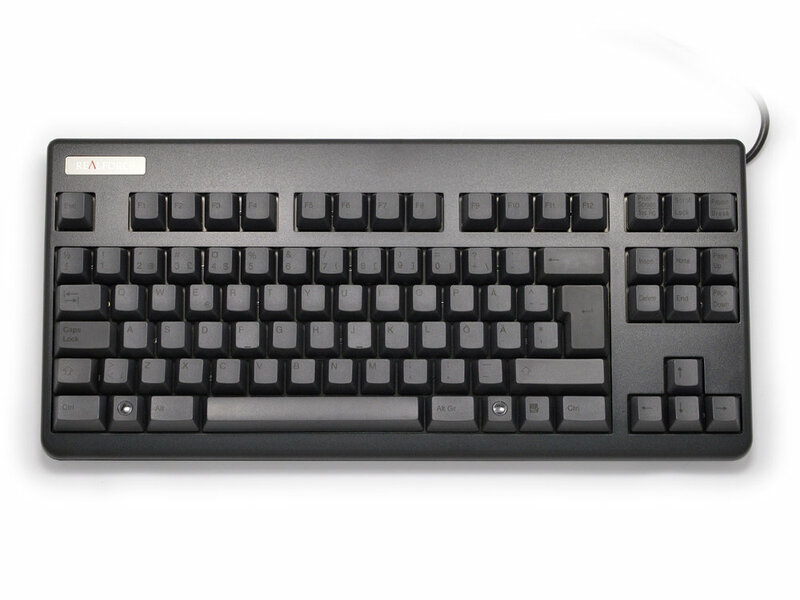 Written review of the Topre Realforce 88UB 45g uniform Topre keyboard. If you're considering buying this keyboard then you probably know that its a Topre board. You'll likely also know that the Topre switch is a hybrid switch, which combines a rubberdome and a conical spring to give the right balance betweein tactile feedback and smoothness. And you're right. It is indeed a Topre keyboard, which is very tactile and smooth. I can't give you the facts and numbers behind this exact keyboard, but i can tell you that Topre is not all hype. This keyboard is very, VERY, good. The first thing i noticed after taking this board out of the box, was how sturdy it was. It is literally build like a tank. There's no sqeeking when handling the board. Theres no rattling. Everything is build to perfection, and fits together with precision. The typing experience is very pleasant. The Topre switch offers great tactile feedback and the domespring combination cushions every keystroke for increased comfort over long typing sessions. Another thing you'll notice when using this keyboard is how every keystroke on every key will feel the same. The consistency on the Topre switch is unlike any other keyboard switch i've tried. Personally i found that the key consistency added to my typing precision, and i've found myself making less typos with this keyboard. On top of the switch sits the keycaps. In this case they are made out of PBT plastic and have dye subliminated legends. The caps are dark grey with black legends. This gives the keyboard a very stealthy and understated look, which i personally enjoy very much. The surface of the keycaps have a very nice texture to them, and are very comfortable to use. To summarize. This is a very sturdy, tactile and comfortable keyboard. If you like tactile keyboards and are all about quality, then this keybaord may be just for you. I've given the keyboard the rating 55, and it comes greatly recommended from me.